Easy Origami Dragon -Quick Paper Dragon to Make as a Pin! The origami vignette of St. George and the dragon, featured on our previous post, was well received by the St. George’s School Community annual alumni weekend on May 16th. As a gift for members of John’s class of 1974, we made more than one hundred paper dragons like the one shown in the photo above. A clasp was mounted to the back of the model so it could be worn during the weekend of festivities. Our gift was appreciated and worn with pride. This particular origami dragon, made with two pieces of paper, is a design of Emilson Nunes Dos Santos* (Brazil). Emilson is a master of whimsical origami figures using multiple sheets of paper. Another example of Emilson work is Our Lady of Aparecida shown previously here at OrigamiSpirit.com. The following step-by-step video shows how to make Emilson Nunes Dos Santos’s paper dragon. Thank you to Emilson for granting permission to present your model. Diagrams for this dragon can be found at the lovely blog of Vera Young. All kind of papers can be used to make this origami dragon. Paper such as “Tant” or regular office paper would make good choices. In the video, the dragon is demonstrated using a paper similar in weight as office paper. The finished paper dragon shows only one side of the paper. It is not necessary to use paper with a different color on each side. 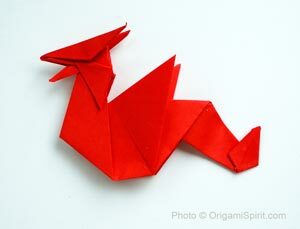 The origami dragon is made with two squares of paper, one for the body, and one for the head. The paper for the head should be one quarter the size of the square for the body. A good size to learn the model would be 6×6-inch (15×15cm) for the body, 3×3-inch (7.5×7.5 cm) for the head. To make origami dragons for pins, use paper that measures 3×3 inch (7.5×7.5 cm) for the body, 1.5 x 1.5 inches (3.75×3.75cm) for the head. The head and body hold together by a hook of the body inserted to a pocket at the back of the head. If making pins, fix the head with a drop of glue. Begin the body of the dragon by making a fish base and skip the video to minute 2:42. Begin the head by making a waterbomb base and skip the video to minute 7:18. Hi, Leyla! Great post! :) Could you tell me what kind of glue do you use for the pins? I use a “hot glue” It comes in bars and is applied with an electric device. Leyla, I love this model because it’s relatively simple to fold and great for teaching children and beginners, but also because it’s a great looking dragon. I also discovered a couple of new ideas for it: After you insert the neck tab (made slightly longer) into the separate head, you can lock it on by putting a small inside reverse fold behind the head between the horns. Also if you don’t mind using glue, don’t insert the neck tab into the head but make it a little longer and glue the head on top of the tab, giving it ferocious open mouth. Thank you for showing this wonderful dragon! Both excellent suggestions Talo!! Here I share a photo of the dragon with the “ferocious open mouth”. Thank you for sharing your creativity here! And we can add some fire to the fierce mouth! For the moment there is no video for the virgen. Wonderful work! Thank you, Leyla. Acabo de saber por você do livro do Emilson. 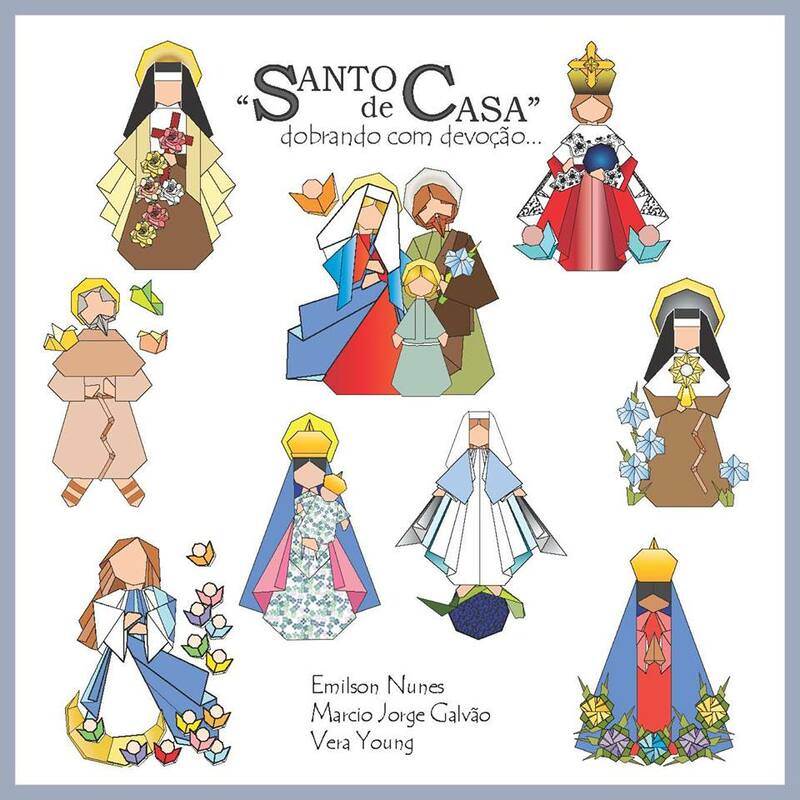 Já conhecia algumas das criações dele, como Nossa Senhora Aparecida, padroeira do Brasil e São Francisco de Assis, outro santo bastante querido e popular por aqui, mas só agora soube do livro. Me encantan las figuras de Emilson. Yo también supe de su libro hoy y entonces alcancé a añadirlo a este artículo. Yo acabo de comprarlo en Amazon… ahora a esperar :-) Gracias por escribir.